I’ve not been swimming for a couple of weeks and I’ve hugely missed it. It’s as much about that moment when you’re changed and plodding along the pavement and realise every muscle feels stretched as it is about being in the water again. But when I’m in the pool it helps clear any cobwebs in my head, almost like a factory reset. 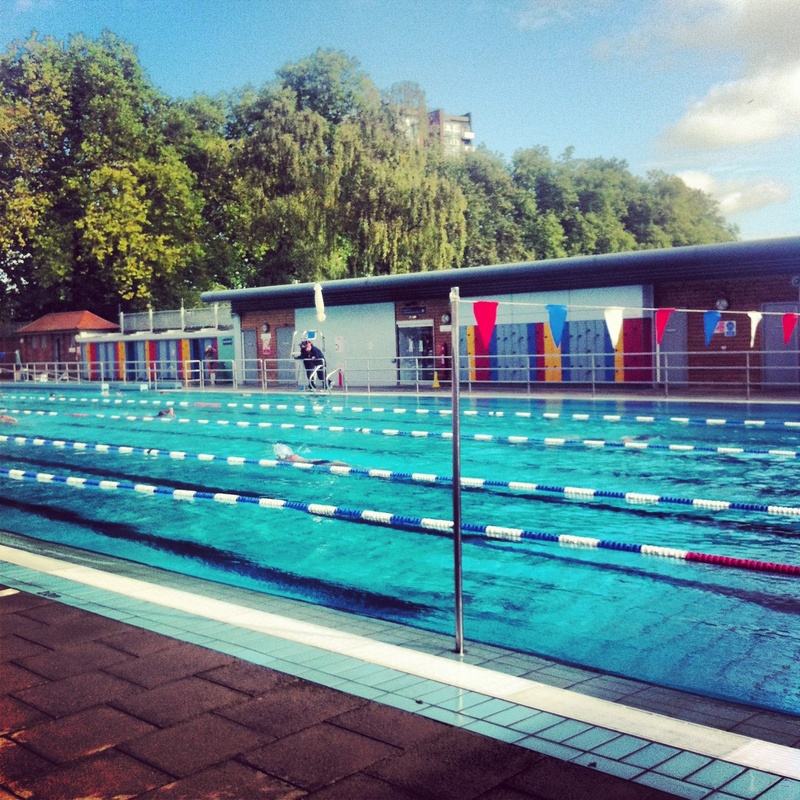 London Fields was the Lido I have been most looking forward to. My mecca of Lido’s as my Dad would have spent much of his wayward youth in this area. It’s London’s only Olympic sized heated outdoor pool and a hefty refurbishment means it’s spick and span (apart from the smell of feet at the shallow end, dozens of damp flip-flops not making for a pleasant pong). The beauty of this being that I can daydream about swimming in the snow or fog as it’s open all year round. It was like swimming in rush hour this morning but it was fascinating to see the different sorts in the pool. Someone teaching his girlfriend to swim, kids club, a woman breaststroking with head action like a woodpecker and a ton of skillful swimmers. 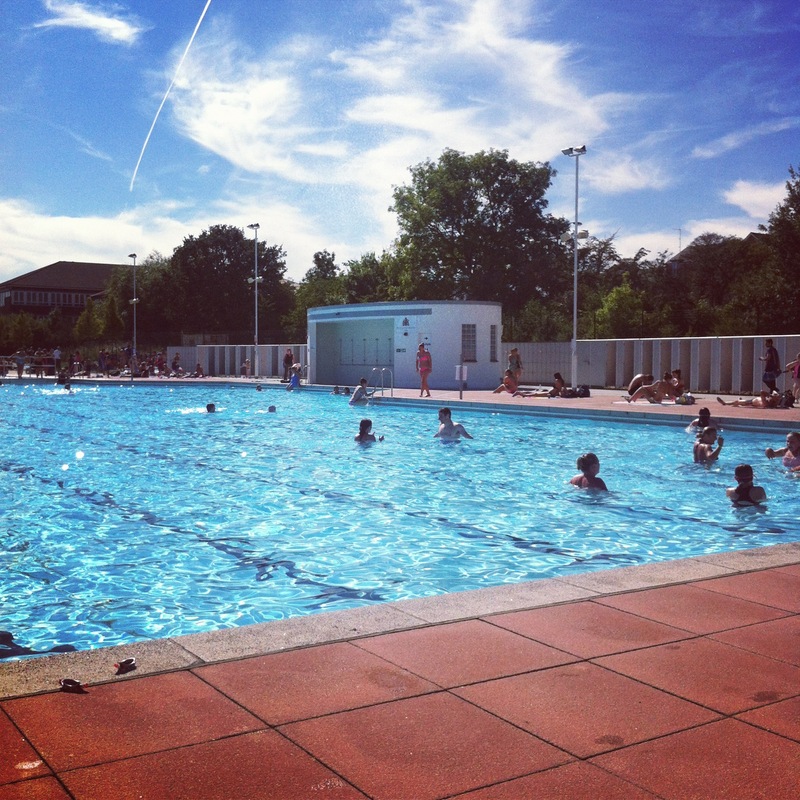 London Fields Lido is now my favourite pool by a country mile. This swim is dedicated to those that didn’t make it to the water today. 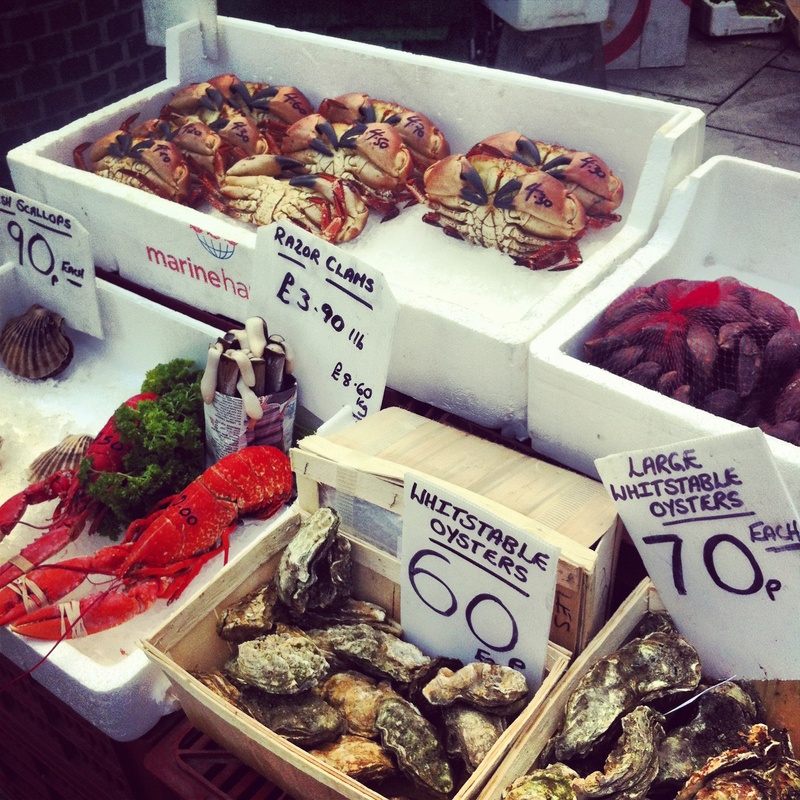 The crustaceans outside Hackney Central station. RIP. Nestled amongst a ton of concrete is a Lido in the centre of London. I’m as surprised as you are. 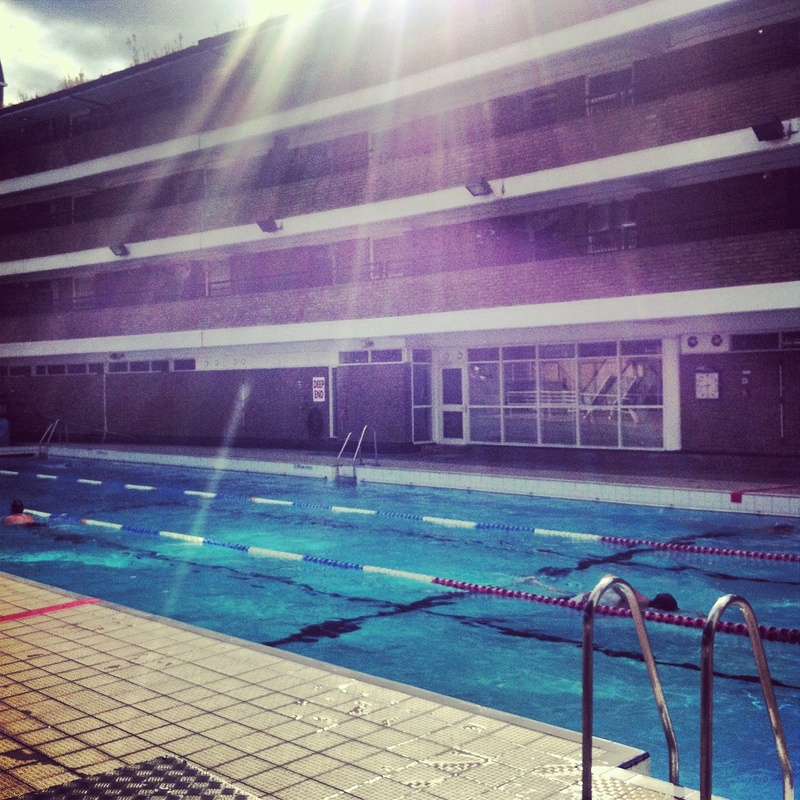 Oasis Sports Centre is situated on Endell Street near Shaftesbury Avenue and sits alongside their indoor pool. Both 27.5 metres long, both heated so the outdoor pool is open all year round. I have to say swimming in this pool was much like trying to walk through central London on the last day of Christmas shopping. While I don’t mind a busy pool (in fact relish it) this was a bit too shambolic. Lifeguards were trying and failing to get people swimming clockwise and in the right lanes. The effect was a six-year-old in the fast lane being overtaken by experienced swimmers, someone zigzagging in vague directions while backstroking, a man with the oddest physique I’ve ever seen just doing stretches wherever he felt like it and a woman doing doggy paddle in her actual glasses. I had to hop between lanes based solely on how quiet they were. On the plus side I was able to race the strong swimmers without their knowledge of course. Quite nice to get secretly competitive. It’s great for a central location but fairly frustrating to swim in if busy. On Friday I was planning which of the remaining Lido’s I should visit over the weekend when I found out it was the last day the mixed pond on Hampstead Heath was open this year. It was also the day I found out that over 5,000 crayfish are nipping the swimmers, like a fishy version of The Warriors they are vicious and marking their territory. Now my reaction to this surprised no one more than it did me. The news of the crayfish settled it for me. I was heading to Hampstead Heath this weekend. The reason is simple. I just wanted to prove to myself that I am braver now than I was a year ago. I know what I’d have spent my Sunday this time last year doing and this would never have even entered my brain. I’d have never been jumping in to swim amongst nasty critters in them waters my friend, I’d have been voted least likely to in a poll in fact. On Sunday I had a text from my friend saying “Please tell me you’re not in the pond you nutter?” I replied with mild hysteria after I had got out saying I AM BRAVE. All capitals. I won’t lie to you, I was screaming inside and my imagination was in overdrive, picturing tons of little red angry crustaceans following the kick of my legs, the Jaws theme playing on a loop as fat raindrops plopped on my swimming cap. But I done it. 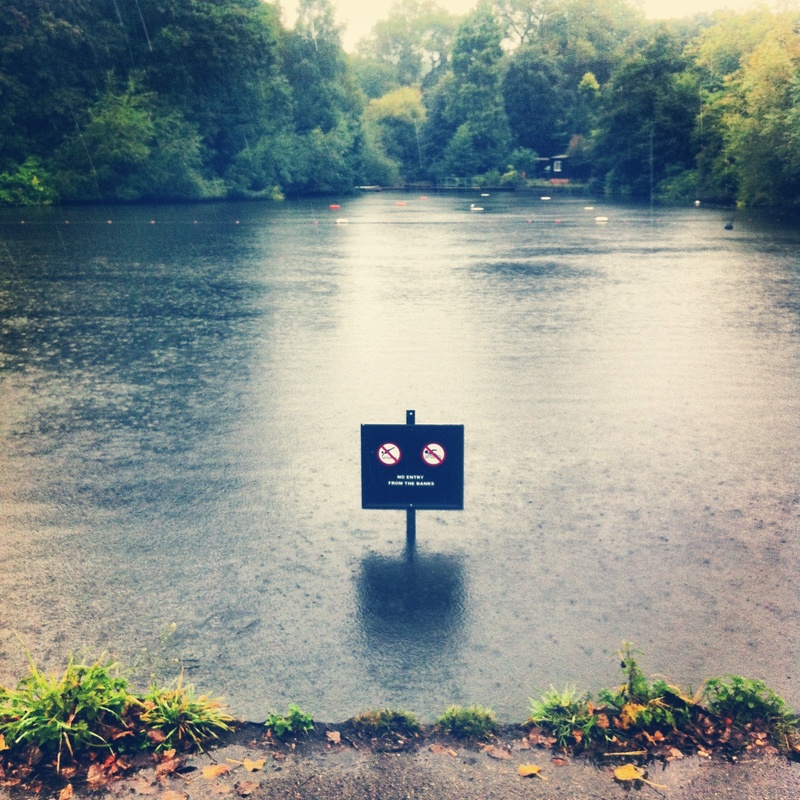 Both the men’s and ladies pools remain open all year so you can still swim there throughout the year, to swim in this specific pond you need to belong to Hampstead Heath Winter Swimming Club. It’s a bargain £2 and I like the machine you use to pay, like a parking meter for swimmers. The water was warm, best time of year for freshwater swimming. I felt drier and warmer in the water than out of it given the torrential rain that’s hit us. The thing is, if you can get over the critters, Hampstead Heath is fraying at the edges as we turn to Autumn, ragged and serene. It was a rather beautiful moment in my swimming quest. But the five-star reward goes solely to me for doing it. I am home this weekend full of flu, snot and aching bones (my parents are convinced this is a reaction to London 2012 coming to an end, I’m beginning to actually believe them). In my not so sensible head I decided the first thing I should do on arriving yesterday would be a refreshing open air swim in a Lido fed by fresh seawater. Turns out salt water and the cold are not effective cures and I should have stuck to Lemsip and wearing thick jumpers. 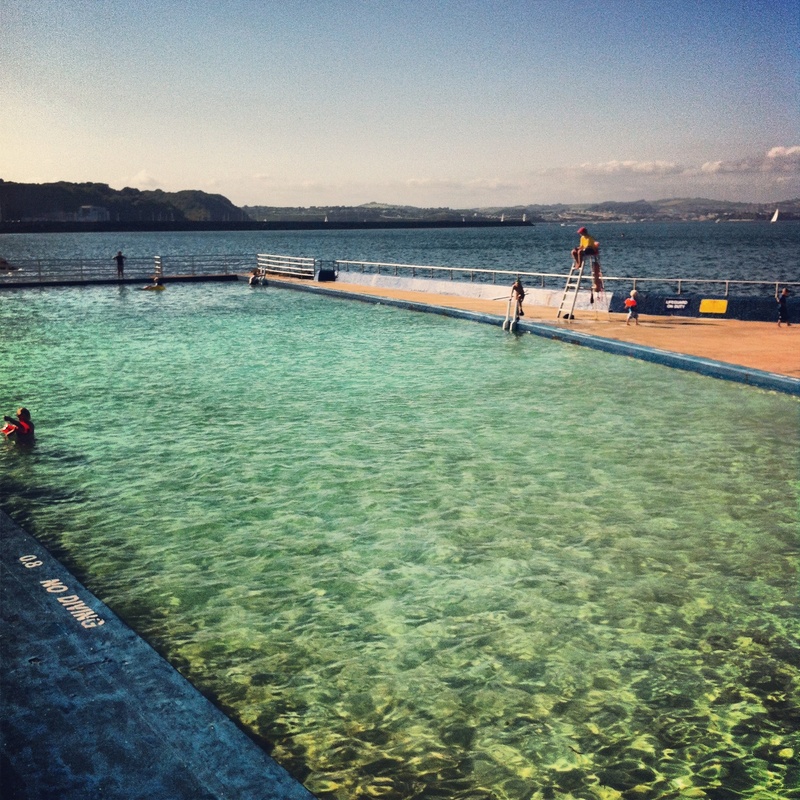 I’ve never really though of Shoalstone as a Lido, it’s always referred to as a pool. But by definition a Lido is a public open air swimming pool and you can’t get more open than this. It sits right on the craggy rocks of Shoalstone beach in Brixham, unimpressed sea gulls look on as people take the plunge and your immediate view is the sea and the rest if Torbay stretching out around it. It appears children and yours truly were the only ones idiotic enough to risk the occasional clump of seaweed that’s washed over, the limpets clinging to its painted sides and the slightly slimy feel of the concrete. What is surprising is just how warm the water is. My dad tells me September and October are the warmest times of the year to swim in the sea (he didn’t explain the logic but I’ll take his word for it). What felt odd was getting back into the stride of swimming in salt water as the buoyancy meant my bum kept bobbing up to the surface and I had to work hard to keep it down. Add that to the coastal wind that makes you feel like your swimming against the tide and you get a very tired me. Still, it was nice just floating on my back with no effort when I’d had enough, looking up at a cloudless bright sky. Also, I can confirm that at the ripe old age of 33 you’re never to old for your mum to stand pool side taking embarrassing photos of you in your goggles and cap. But I did appreciate her holding out the towel ready for me when I got out the pool. With this being Devon I was then able to come home barefoot with said towel wrapped around me. Maybe I’ll try that on the tube on the next Lido I visit back in London, leave a big wet bum print on the Jubilee line and see if I can make it home without being sectioned. 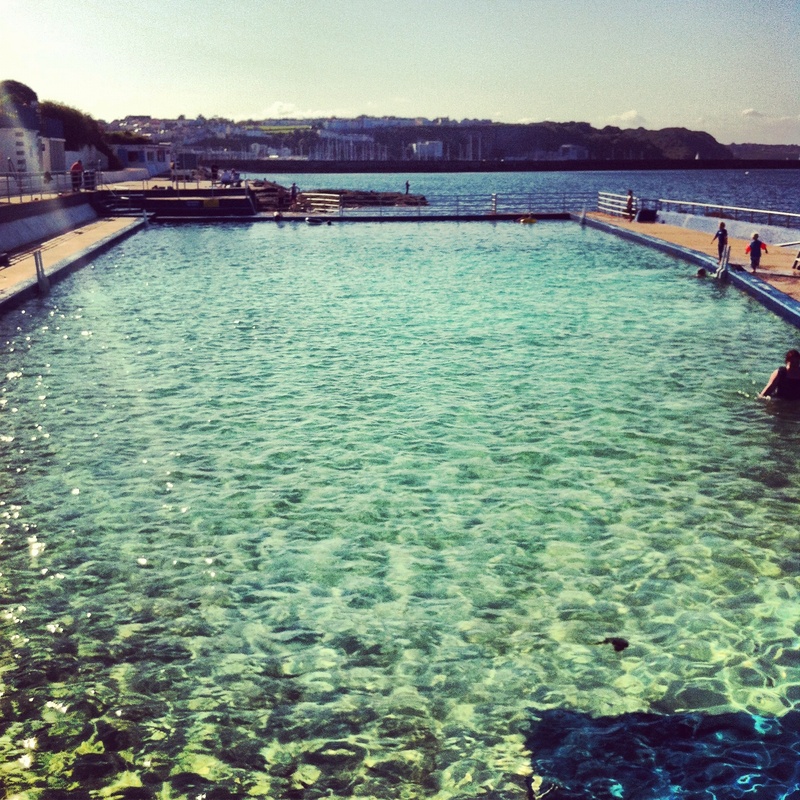 What is sad about Shoalstone Pool is that it is in danger of disappearing. Lifeguards have to be present and Torbay Council will not fund this. At the moment it is looked after solely by volunteers. I believe the local community is fighting hard to set up a charity to save the pool. It is one of the few remaining freshwater pools in the UK, swimming in saltwater felt like I was exfoliating as well as exercising and what’s more it doesn’t cost a penny to use. It was a huge part of my *youth and I would be sad to see it go. *I snogged David Watts down there when I was a teenager. I fancied him for ages. I still think of him when I hear The Kinks song. Firstly let me congratulate Hillingdon Lido on showing some sense and remaining open for a bit longer this year due to our Indian Summer. In comparison to the frankly frustrating and borderline idiotic conversations I’ve had with Finchley Lido it’s been fantastic speaking to staff here who show good old-fashioned customer service. Secondly, I am utterly in love with this Lido. It smelt of suntan lotion and the faint tang of Chlorine. Buxom bikinis and leathery old men sprawled around the pool soaking up the sunshine, I suspect more people were there for the sunbathing than the swimming as the main pool remained surprisingly quiet. I even allowed myself a moment of the holidaymakers (that’s Grockle if you come from Devon like I do) and lay out by the pool reading my book listening to Dave, Dee, Dozy, Beaky, Mick and Tich. While it was an ultimately calm and beautiful environment there was one annoying sod. 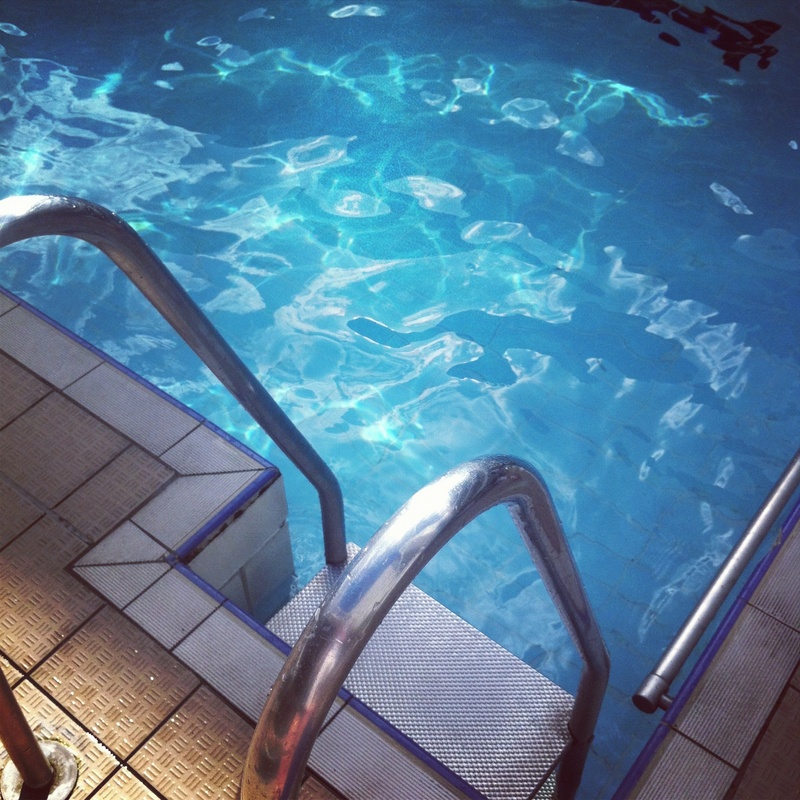 There is an unwritten rule in the life of the Lido, in fact of all swimming pools. You swim straight in lengths or widths, children are allowed to freestyle. So when I spotted someone swimming diagonally towards me I suspected something was afoot. The directional offender asked a variation of “has you mate got out the pool? you here alone” on FIVE occasions. It wasn’t in the friendly manner that I discussed the weather and Ritz crackers with another chap there. It was in a manner that made me feel like I was in the wrong for being female and alone in public (adding to that you’re essentially exposed when in your swimming costume). It is very hard to give a stony stare when wearing swimming goggles so I just had to zig zag my way past him. Another pool nestled in Art Deco Grade II surroundings, it is 67m long with two children’s pools separate at the far end (which meant any splashing hysteria gravitated away from the main pool). It is immaculately maintained and the water is sparkling clear (although I guess most things would be after The Serpentine last week). It was worth travelling to Uxbridge for and would happily visit again and again. 1. First off I was lucky enough to get tickets to the Paralympics and my first of three visits took place yesterday. Day passes meant we were lucky enough to watch 7-a-side and Wheelchair Basketball. While watching Great Britain’s Women’s team it struck me how ridiculous the term disability seems. They were super fast, graceful and fearlessly competitive. I was captivated and inspired. The term SuperHumanAbility seemed more fitting. Anyone who doubted this would capture the hearts and minds of people in the same way that the Olympics did is being proved emphatically wrong. I am sure I will write more about this separately. Tonight I head to the Aquatics Centre, any regular readers of this blog will know I have a rekindled love of swimming so I am beyond giddy. 2. When I first moved to London Kings Cross was frankly dire. I lived at the top of York Way and my cousin lived behind the hall opposite the station, so I frequented dives such as The Dolphin and The Dunaree (where once I sang karaoke with my arm in a cast and was heckled with “f**k off Pudsey” and when locals asked to sign my cast they drew massive knobs all over it). It’s almost becoming unrecognisable now, its pulling up its socks and a lot of exciting things seem to be happening there. Tuesday night I scoffed myself silly at newly opened Caravan. 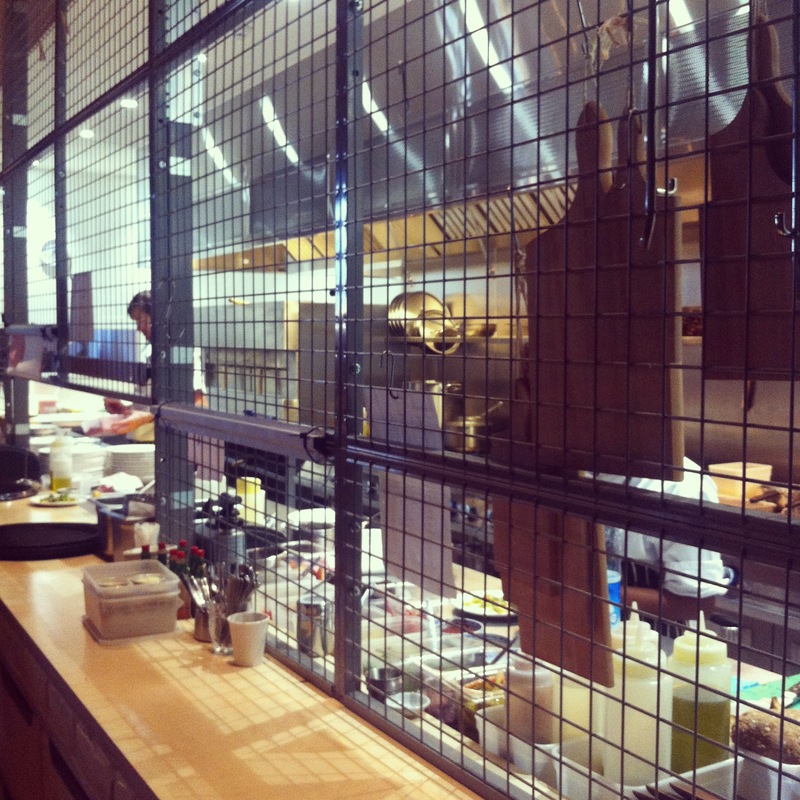 Can’t recommend this place enough, excellent service and some buff chefs behind that cage. It’s also very reasonable (carafe of wine, two small plates, two pizzas and a shared pudding came to £56). Baked cauliflower has never tasted so good! 3. Darren Hayman of Hefner days released Lido this week. 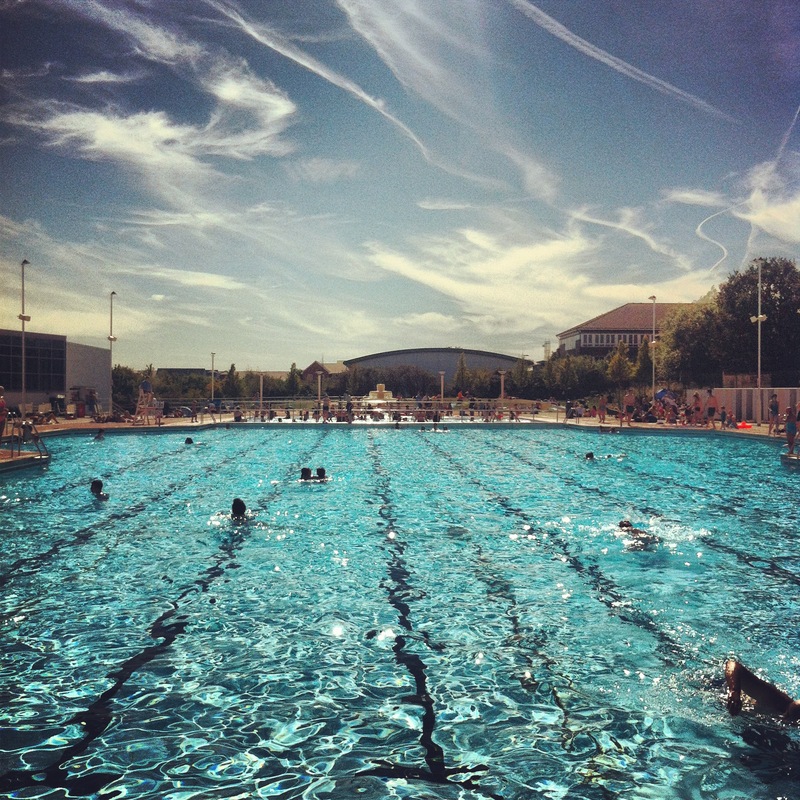 Regular visitors to this blog will know that I’m currently swimming my way round London’s outdoor pools. There’s something about travelling to a pool, in a part of London I’ve never visited before, and having this playing that makes me feel like I have a soundtrack to my swimming. It’s a beautiful piece of music. You can buy it here. I took a break from this blog earlier in the week and wrote a piece for Lido Music so do take a read by clicking here. 4. Back to Granary Square for the second time this week, this time for chilly pudding. 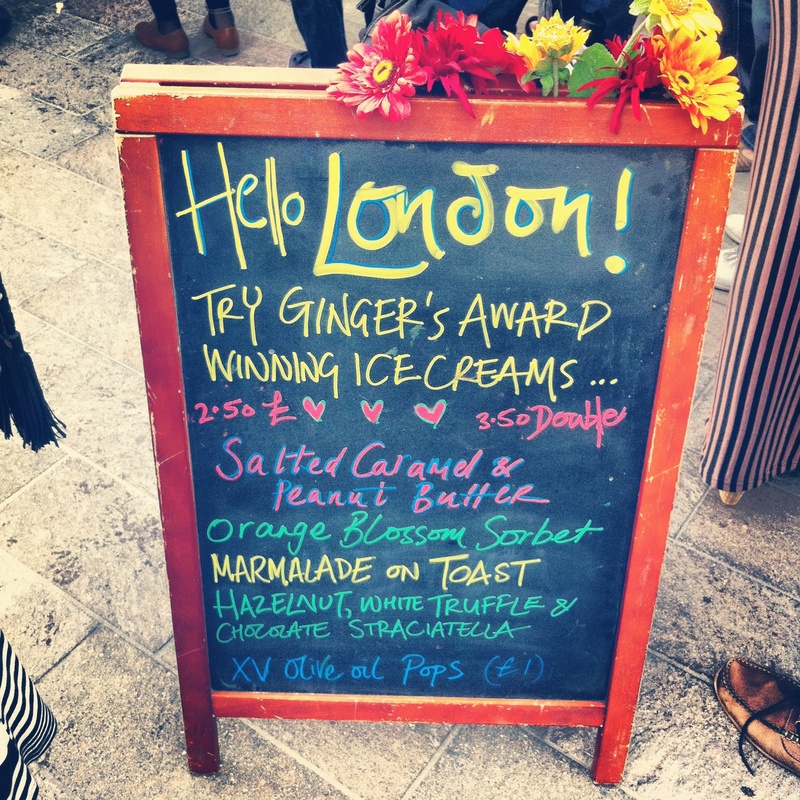 I popped into Kings Cross Ice Cream Festival on route home from Olympic Park yesterday for a salted caramel and peanut butter cone. You have about six hours left today to milk strange fake cows and scoff as much ice cream as you can be bothered queuing for (and you have to be prepared to queue). 5. Allow a girl her nerdy tendencies and let her be happy at the return of Dr Who. It’s one of the very few TV programmes I bother to watch and I geek out when it returns. If our introduction to the new companion is the standard to go by Jenna-Louise Coleman has the potential to outshine Matt Smith. Hugely excited! I won’t lie. I had to psych myself up for the Serpentine. I had turned open air swimming (by that I mean in rivers and ponds) into a watery theatre full of creatures Neil Gaiman would write into his books. Water rats and eels… before the cockney’s jelly them. A friend convinced me that my overactive imagination wouldn’t reflect the reality, thankfully she is to be trusted. A few lazy birds lurked at the side and a duck skimmed my swimming cap as it started a low flight to the water. No creatures below. 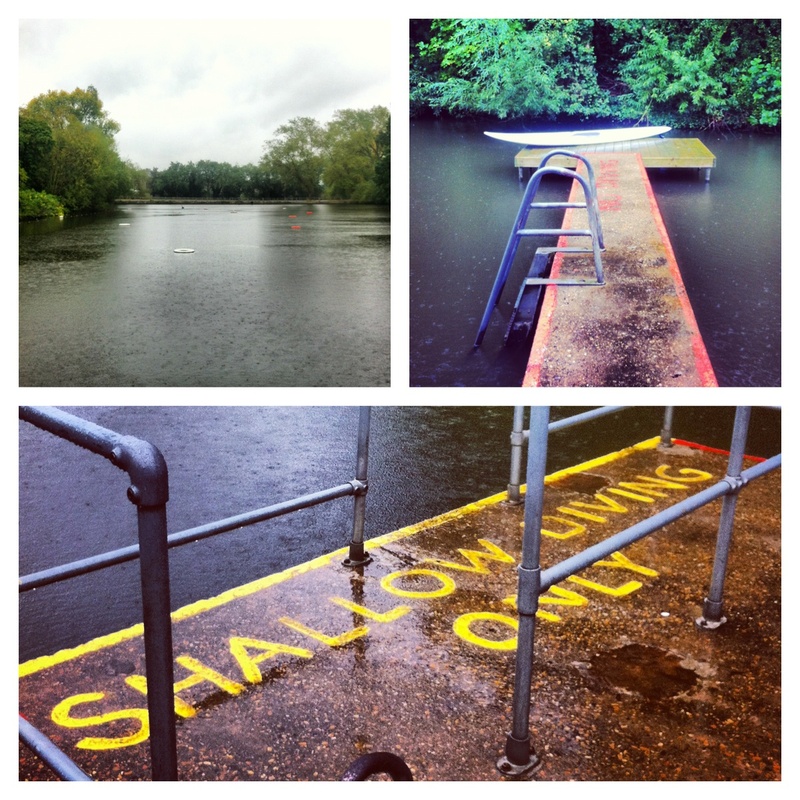 It was freezing, the ramp down to the water is slippery and its very shallow. At all points I could plant my feet on firm soil. But there’s something about swimming in fresh water, even in the chill. Getting that inevitable mouthful of water doesn’t taste quite so foul, even if you narrowly avoid a feather or two. The view is stunning, you won’t beat it. When I was doing backstroke I looked up at the sky and it felt like it it was going on forever. Felt like I was suspended in that moment alone, no niggling worries or stresses on my mind. The heritage and history of the Serpentine Lido is something to feel connected to. George II created The Serpentine for Queen Caroline between 1727 – 1731. Only a few weeks ago I was sat in the stands during The Olympics to watch the women’s 10K marathon swim (so I’ve technically shared the same water as Olympians, how many people can say that?). 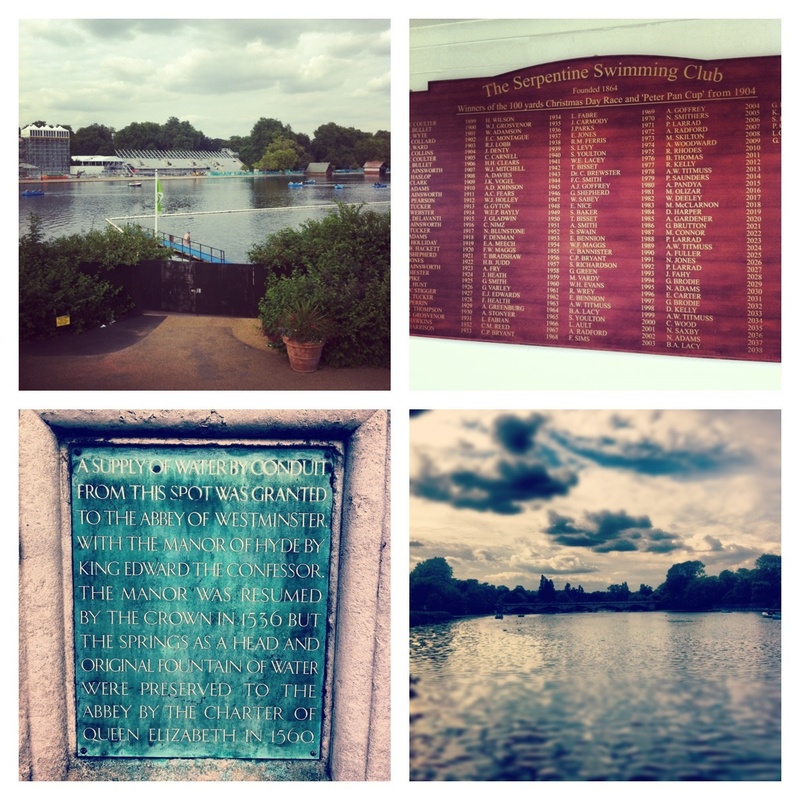 Then of course there’s the Serpentine Swimming Club, formed around the 1830’s. What’s not to love about a swimming club that hold a Christmas day meet called the Peter Pan Cup. The London swimmer Jenny advised me this was only suitable for a dip, and she’s right. But I still loved mentally shouting “I’m doing more exercise than you losers” at the people plodding past me in pedalos. Also, there was a woman swimming that looked exactly like Frida Kahlo in a neon orange swimming costume so I sort of love it for that reason, even if my thighs are still trying to convey their numbness to me three hours after getting out of the water.